Gulf Craft, a major manufacturer of luxury yachts and fiberglass boats, is showcasing its line-up of luxury super yachts, sports cruisers and leisure crafts in Doha. Its newest super yacht models are being showcased for the Qatari market at the ‘Gulf Craft Exclusive Preview,’ which runs till March 21 at the Pearl Qatar, in association with its local representatives, Aurora Yachts and Speed Marine. Meanwhile, the 'Majesty Yachts Exclusive Preview’ event will take place at The Pearl Qatar from March 28 to 30, followed by the Qatari premiere of a new Majesty 135 – Gulf Craft’s second-largest superyacht model, and a brand new Majesty 105 – a superyacht model that had received high praise for its excellent outdoor entertainment capabilities. “The Pearl-Qatar is the yachting playground in Qatar; and no doubt that having established marine facilities and being a lifestyle destination of choice for many yacht enthusiasts, The Island will continue to lead the boating marketplace for years to come,” he added. Leading the line-up of models from its Majesty Yachts, Oryx sport cruiser and Silvercraft leisure craft range will be the Majesty 135, the largest-ever superyacht to be showcased in Qatar, and the largest model completed by the shipyard to date. 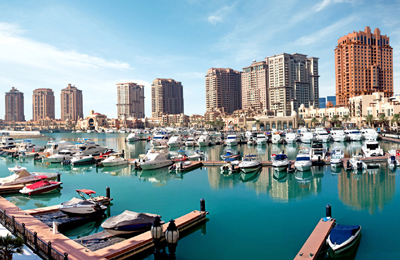 Rounatica Middle East (RME), a subsidiary of United Development Company and manager/operator of all three marinas at The Pearl-Qatar stands to benefit most from the boat show.